March 10, 2017—Serious and baseless new charges have been brought against Karan Vafadari and Afarin Neyssari, the dual-national Iranian-American and his wife who have been imprisoned in Iran’s Evin Prison without any evidence of wrong doing or due process for almost eight months. The couple, art gallery owners in Tehran who are prominent in the Iranian artistic and cultural community, were arrested by Iran’s Revolutionary Guards Intelligence Organization at Tehran’s airport on July 20, 2016—ostensibly for serving alcohol in their home and hosting mixed-gender parties. 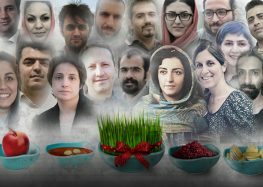 The new charges, detailed in a blog by Vafadari’s sister, Kateh on March 8, 2016, include attempting to overthrow the Islamic Republic and recruiting spies through foreign embassies. Their imprisonment, the latest in a long string of cases, reflects the determination on the part of the Guards and their cohorts in the Judiciary to intimidate dual nationals from western countries and exact a brutal cost for those who dare interact with diplomats and foreigners from the West. The Center for Human Rights in Iran (CHRI) calls for the immediate and unconditional release of Karan Vafadari and Afarin Neyssari, whose imprisonment on completely unsubstantiated charges and without any evidence of wrongdoing represents a brazen defiance of the law. Shortly after the couple’s arrest they were taken in handcuffs to their home and then to their gallery, where items of art were either confiscated or destroyed. They were denied access to counsel for months and held for extensive periods in solitary confinement. During intensive interrogations, Afarin Neyssari was told to spy on her friends in the art world and her husband; when she refused, she was returned to solitary confinement. Most of the original charges were dropped by the prosecutor for lack of any evidence. The earlier charges included serving alcohol in the home and organizing mixed-gender parties for diplomats—even though Vafadari is Zoroastrian and under Iranian law not subject to Islamic laws on alcohol and mixed gatherings. The judge selected for the case was Abolqasem Salavati, a notoriously hardline judge routinely picked for dual national cases and other politicized cases in which the Guards and the Judiciary are seeking an unquestioning and harsh ruling. At the preliminary hearing, the earlier charges dropped due to lack of any evidence were re-instated by Judge Salavati. Judge Salavati did not allow the couple’s lawyer to be present at the preliminary hearing—and ordered the couple to dismiss their lawyer. The imprisonment of Vafadari and Nayssari also appears motivated by greed: the Islamic Republic has a long and documented history of unlawfully confiscating private property, especially that belonging to those with whom the authorities do not favor. The family of Vafadari reported continuous calls right after the couple’s arrest demanding money, and noted that the charges brought would allow the seizure of the couple’s extensive properties. Vafadari’s sister, Kateh, has implored “all those who stand for civil liberties, artistic freedom, minority rights and Iran’s self-determination…[to] write letters of support asking for Karan and Afarin’s immediate release” to Iran’s Permanent Mission to the UN and to Iran’s Head of the Judiciary.